This construction video provides detailed guidelines on how to use slope deflection method on beam. 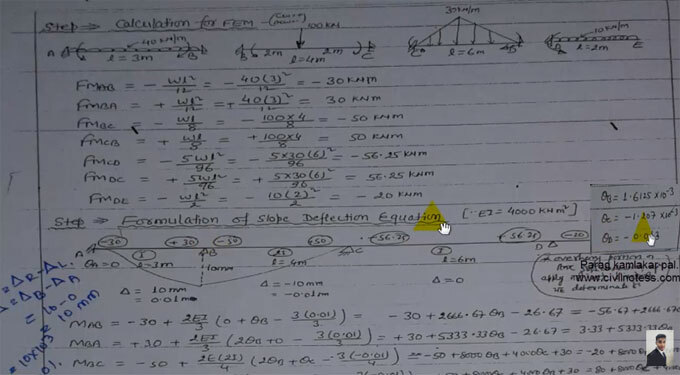 The slope deflection method is mainly applied for structural analysis for beams and frames. Under displacement method, initially the unidentified displacements are defined by providing solution to the structure’s equilibrium equations; then the other response characteristics are assessed with compatibility considerations and member force‐deformation relationships. The displacement methods are categorized as Slope‐Deflection Method and Moment‐Distribution Method. Slope‐Deflection Method - This method only considers the bending deformations. With this method, one can get clear idea on the Matrix‐ Stiffness Method, which develops the foundation of most computer software which are presently applied for structural analysis.